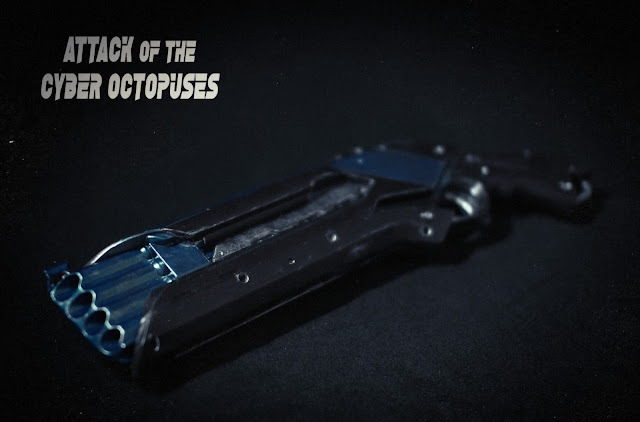 Cyberpunk Nerf Custom Mod for Attack of the Cyber Octopuses short film - "Tina Plasma Gun"
Here I am with the "making of" of the third and last weapon for the three cyberspace detectives! (more info about the project on the official website or facebook page). Again it's a Nerf gun (Roughcut to be precise) with some modifications and paint. I started as usual by sanding the whole rifle, taking away any logos or text. Then the weapon was dismounted, masked and prepared for the primer coat. Here's how it looks after a first layer of gray primer spray paint. I then masked away some parts to have metallic blue decorations. Next step was dry brushing silver acrylic to make it look worn and scratched. 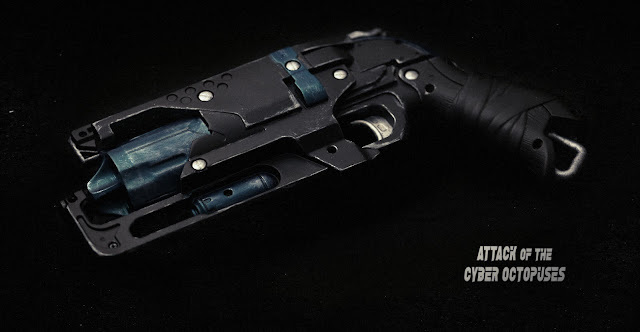 As you could have noticed already, there's no fore-end on the final weapon. I preferred to get rid of it, I think it's more "cyber" and less mechanic without it! And here's the final result!!! 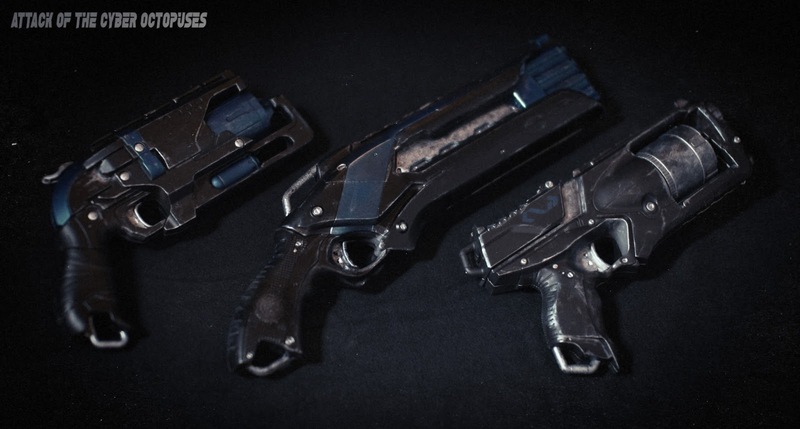 And the set of three weapons all together! That's it. I hope you enjoyed this making of please follow the social media! 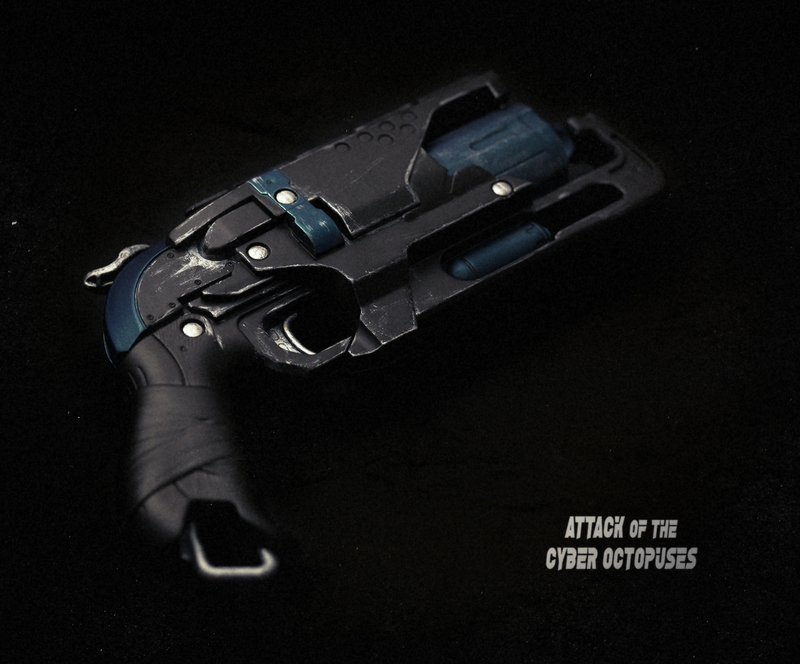 Welcome to part 2 of the CYBER OCTOPUS! From this link you can watch the "making of" of part 1. Basically in this part I dealt with tentacles. 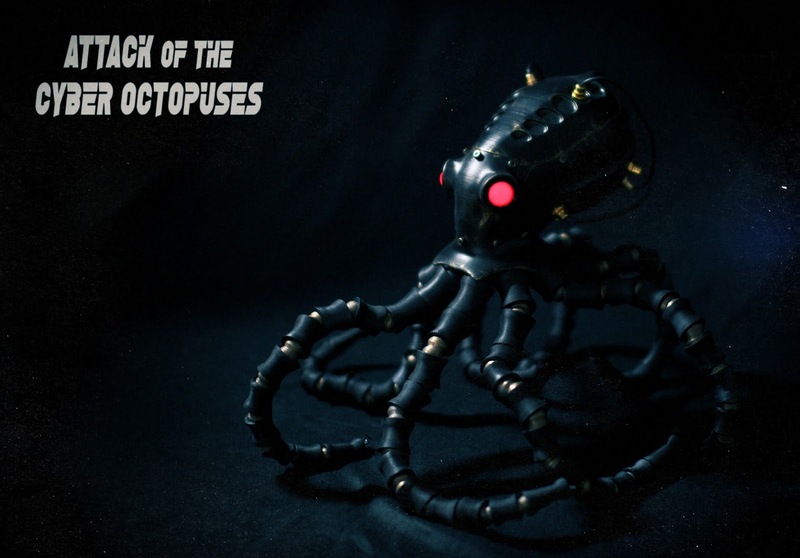 The big challenge was to have something movable but sturdy at the same time, to allow easily stop motion or moving the octopus with nylon wires. Inspired by some online projects, I designed tentacles that are held together with an elastic wire, 5mm thick. The whole printing took lot of time. There are 168 pieces for the tentacles (21x8), and for each tentacle it took approx 8 hours!! Then I continue the printing... it took me a week more or less, 8 hours a day of printing! Lot lot lot of pieces...! Then I painted them in black and gold. Again trying to obtain some worn/dirty effect. 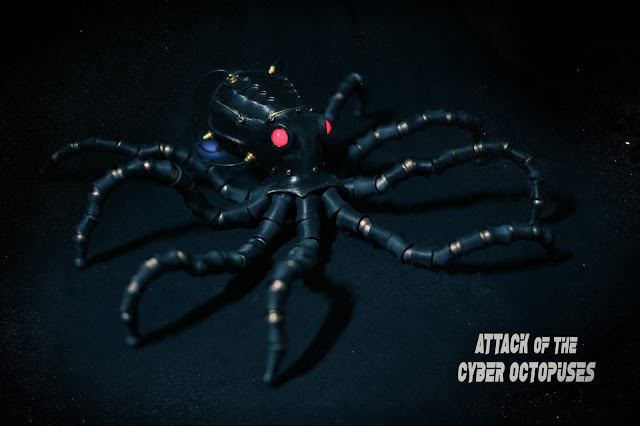 And here is the final Cyber Octopus!!!! You can also subscribe to the OFFICIAL FACEBOOK PAGE and share it with your friends! 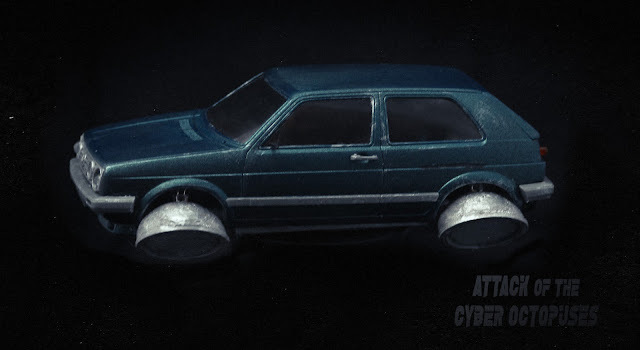 I'm keep working on ATTACK OF THE CYBER OCTOPUSES film project, modding 80s plastic car models to be adaptes as flying cars! As you can read on the official website, the whole project is almost without CGI, but using practical effects and miniature models. First of all I drilled holes for the LEDs, 5mm for the front ones, 3mm for the rear ones. 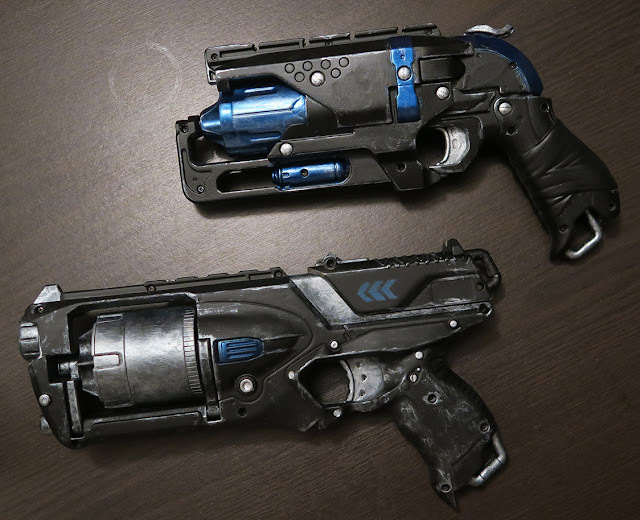 I then sanded the whole body and painted in dark blue metallic. Here is the body with further details and some dry brush with silver acrylic. As for the whole project, I like a worn, "dirty" effect. I then smoked the windows, for a more cyber, futuristic effect. Here's the model with the interior. I then 3D printed the biggest modification of the car, the engines that makes it fly! The engines have a hole to house perfectly a 5mm LED. I then glued my 3D printer mod to the base of the car and dry brushed a bit. Trickiest part, the LEDs wiring. 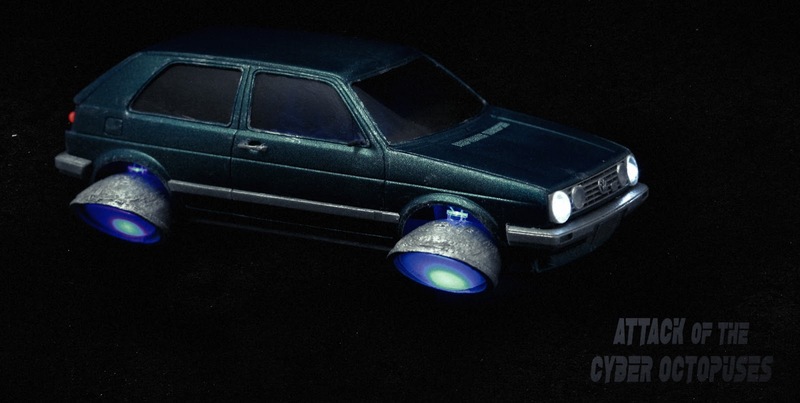 And here the final fancy photos of the car, ready to fly in the sky of Neo-Berlin, 2079 AD!!! Please consider this is a zero budget project. Any support (even just a share or a like on the facebook page!) are very very appreciated! Hear you at the next prop/model!! !